For more than 30 years, the highly regarded Secrets Series® has provided students and practitioners in all areas of health care with concise, focused, and engaging resources for quick reference and exam review. 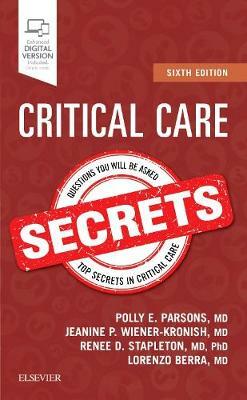 Critical Care Secrets, 6th Edition, features the Secrets' popular question-and-answer format that also includes lists, tables, and an easy-to-read style - making reference and review quick, easy, and enjoyable. Key Features Fully updated throughout, with new chapters on neurological monitoring, obesity in the ICU, new ultrasound practices, ICU survivorship, and the latest cardiac technology such as ventricular assist and percutaneous support devices. Written and fully updated by clinical and thought leaders in critical care who have contributed chapters in their areas of expertise. The proven Secrets Series® format gives you the most return for your time - concise, easy to read, engaging, and highly effective. Covers the full range of essential topics in critical care for in-training or practicing professionals, including anatomy, physiology, immunology, and inflammation - fundamentally important topics in the effective care of critically ill patients. Top 100 Secrets and Key Points boxes provide a fast overview of the secrets you must know for success in practice and on exams. Portable size makes it easy to carry with you for quick reference or review anywhere, anytime. Expert Consult™ eBook version included with purchase. This enhanced eBook experience allows you to search all of the text, figures, and references from the book on a variety of devices.